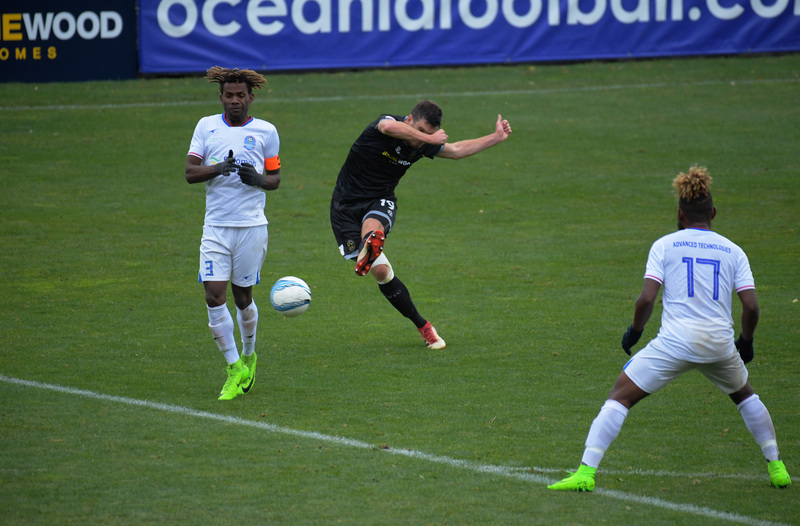 Defending champions Team Wellington have produced a clinical second half performance to brush aside Solomon Islands rivals Henderson Eels 6-1 and book their place in the semi-finals of the OFC Champions League. Following a keenly contested 45 minutes in cold and rainy conditions in the New Zealand capital, the home side scored four unanswered second half goals to send an ominous warning to the rest of the competition. Very little separated the two sides during the early exchanges with chances coming at both ends before this year’s leading marksman Ross Allen broke the deadlock with a superbly executed drive from the edge of the box in the 18th minute. Team Wellington doubled their advantage in the 29th minute amid confusion as the Solomon Islands players have stopped expecting the offside flag to go up only to watch Angus Kilkolly tapping into the empty net after being set up by Jack-Henry Sinclair. To their credit Henderson fought back just before half-time when Alex Palezevic fouled Tuti Zama Tanito inside the box to give away a penalty which was coolly converted by Tanito himself. Any hopes of a Henderson Eels comeback however were dashed less than a minute into the second half when Jack-Henry Sinclair restored the hosts’ two goal cushion with a close range header. Ross Allen made it even more comfortable for the New Zealanders with a powerful drive from the right side of the six yard box in the 56th minute before completing his hattrick three minutes later with a header from a beautiful cross from Angus Kilkolly. Jack-Henry Sinclair capped the win for the hosts with a left-footed low drive from 11 metres out. Wellington coach Jose Figueira was delighted with the result but admitted the Solomon Islanders have caused some headaches for his team in the first half. “Credit to Henderson Eels, we have done our homework on them and knew they had some dangerous players on the break,” he said. “In the first half we were a little bit disconnected and after getting 2-nil up we got relaxed a little bit and moved away from what we usually do. However, Figueira says he couldn’t have been any happier with his players’ professional response after the break. “We’ve adjusted a few things at the half-time break and the guys showed their quality in the second half,” explained the Wellington coach. Figueira also heaped praise on hattrick hero Ross Allen who is a clear favorite to secure this year’s Golden Boot with his goal scoring tally already at eleven. Henderson Eels coach Eddie Marahare was gracious in defeat by admitting the hosts were well deserved winners. “First of all I would like to congratulate Team Wellington on their win, I think they will go all the way to the final. “They played great, to be honest in the second half they played a very high level of football,” stated the Eels coach. Marahare praised his players for their first half performance but couldn’t hide his disappointment regarding their effort after the break. “At half time we were still in the game and in the dressing room we had belief but unfortunately we were punished for our lack of concentration. “That early goal in the second half was a big blow, it really unsettled the boys. “The conditions were also a bit tough for the players but that shouldn’t be an excuse,” Marahare added. The defending champions will next travel to New Caledonia to face Hienghene Sport in a do-or-die clash for a place in the title decider and Jose Figueira says his side can’t wait for the challenge. “We are already looking forward to that and with a one-off game it’s going to be huge. “We know Hienghene very well, I know the coach really well, the players know each other well and we’ll have familiar surroundings. “But we will be doing our homework starting tomorrow to get ready for a tough challenge, we can’t wait for it,” said Figueira.